A lonely and bleak-spirited police officer named Taki Kazuya works in America, though the fires that once drove him seem to have burnt out. A supernatural attack on children - his friends - revives the fire that once burned brightly within! 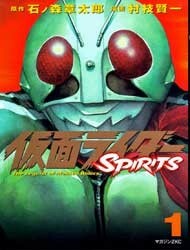 Together with the help of Kamen Rider 1, Hongo Takeshi, he drives off the threat. However, he learns that there is a greater threat looming on the horizon and sets out to find Kamen Rider 2, Ichimonji Hayato.